I write this on what would have been John Webster’s 61st birthday, 20 June 2016—if he had not gone directly to glory last month. I write to pay tribute to a person I described, long before his untimely death, as the greatest living theologian—the best theologian on earth. Such judgments of course say as much about me as him, yet I continue to think they are, or rather, were true. His passing went unremarked by most Christians, however: there was no mention of his death in Christianity Today, for example. So who was John Webster, why should Evangelicals pay attention, and what is the significance of his unfinished systematic theological symphony? John Webster held positions at St. John’s College, Durham and Wycliffe College in Toronto (both Anglican theological colleges) before being appointed to the prestigious Lady Margaret Chair in Divinity at Oxford University, which he held from 1995-2003, at which time he moved to the University of Aberdeen, where he stayed until 2013, when he took up his final post at the University of St. Andrews. But these institutional moves are but a hop, skip, and a jump compared to the shifts he made in his conception of theology itself. 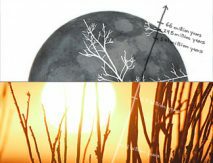 We may discern three phases to Webster’s work as a theologian: early, middle, and late. The focus of his undergraduate studies in theology at Cambridge was on identifying, analyzing, and trying to respond to problems, in particular the “problem of modernity,” which amounted to finding the right language, method, and conceptual scheme for making God-talk intelligible. Barth helped him to see that theology’s starting point could be nothing other than God’s own triune self-communication.In this early period, he was looking elsewhere than theology for answers. He stayed at Cambridge for his Ph.D. and wrote on the theology of Eberhard Jüngel, a German theologian who sought to combine the best of Rudolf Bultmann and Karl Barth. It was during his stint in Canada (1986-1995) that he established himself as an expert in the theology of Karl Barth, publishing several important monographs and editing the Cambridge Companion to Karl Barth. Barth helped him to see that theology’s starting point could be nothing other than God’s own triune self-communication. It was also during this “middle” period that John became familiar with the Yale school, which rightly focused on biblical narrative but tended to focus less on the primacy of God’s authorship of and agency in this narrative than on the church’s reception of it. John’s appointment to Oxford and subsequent return to England in 1996 marks the beginning of his “late” period. His inaugural lecture “Theological Theology” set the tone that would come increasingly to dominate his constructive work for the next twenty years. Similar to Alvin Plantinga’s inaugural lecture at the University of Notre Dame, “Advice to Christian Philosophers” (1984), in which Plantinga encouraged Christian philosophers to have the self- confidence to start from Christian belief and pursue their own agendas, Webster advised Christian theologians to let theology be itself and approach the their task with joy, humility, and confidence in Scripture and tradition, and to remember that doing theology only takes place because God acts upon the human intellect through his revelatory Word and redeeming Spirit. Several people have already written fine tributes to John’s work. Aditionally, a number of his students, colleagues, and friends (among which I am fortunate to count myself) presented him in 2015 with a Festschrift entitled, fittingly enough, Theological Theology: Essays in Honor of John Webster (T&T Clark). The book includes a biographical sketch (“John,” by Ivor Davidson), a list of John’s publications, and a helpful introduction by one of John’s former PhD students, Darren Sarisky (also a TEDS alum). To these I would like to add here a few words of personal testimony. I first met John in 1985. I was finishing up my doctoral studies at Cambridge; he had already finished and was teaching in an evangelical Anglican theological college (St. John’s). At the time he wasn’t yet John Webster (and I wasn’t yet Kevin Vanhoozer), though he had already written a short pamphlet for InterVarsity on Bultmann’s theology. I don’t remember why I visited him, but we spent a pleasant afternoon together. We didn’t reconnect until I admired the boldness of the essay, its clear argumentation, and its thoroughly theological approach.years later, 1997, when we both returned to the UK to our respective posts in Oxford and Edinburgh, at which point I joined the editorial board of IJST. John’s name doesn’t appear in my Is There a Meaning in this Text (1998), but it’s all over The Drama of Doctrine (2005). To my surprise, the index contains more references to Webster than to Wolterstorff, Ricoeur, or Calvin! What happened? In retrospect, I now see why. I had discovered a kindred spirit. Like John, I too was searching for a way out of the desert of criticism–a way out of the methodological morass of modernity and into the Promised Land of dogmatics and doxology, where I could use language to speak well of, and praise, God. 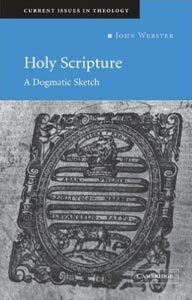 In particular, I came across John’s essay on “The Dogmatic Location of the Canon” (reprinted in Word and Church), in which he re-established the canon, and sola scriptura, in its magisterial place over the church, in contrast to postliberals who were in danger of collapsing Scripture into the tradition of its ecclesial use. I admired the boldness of the essay, its clear argumentation, and its thoroughly theological approach. Holding up and supporting a number of my own signature theological moves was John’s strong Protestant arm. I too can attest what his former PhD students have acknowledged: John was remarkably generous with his time. I was never his student, but I nevertheless learned from him. For the past fifteen years, both his published essays and his informal tutorials (emails) have served me well as crucial guidelines and points of reference for my own research and writing. It will be harder sailing without his lighthouse. 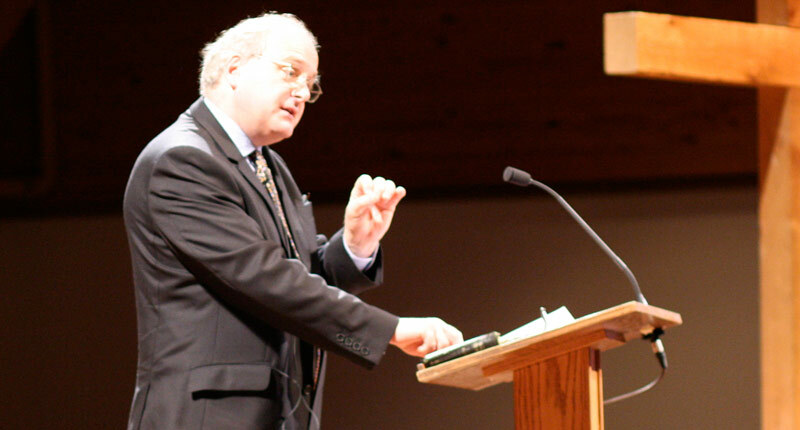 When the Carl F. H. Henry Center for Theological Understanding received funding for the Kantzer Lectures in Revealed Theology, I immediately suggested John Webster as the best person to inaugurate the series. He accepted, and in 2007 delivered six tightly argued talks on “Perfection and Presence: God with Us, According to the Christian Confession.” Here was Webster in fine fettle and the full flowering of his later period, rooting everything in the perfection which is God’s own life in himself as Father, Son, and Spirit. But no. John was dissatisfied with the lectures and continued to rework them (a revised set may yet be published), a telling reminder of how hard it is to speak well of God’s perfection. I last saw John in April 2011. He had come to Wheaton, where I was teaching at the time, to read a paper: “On the Theology of the Intellectual Life” (in God without Measure, vol. 2). It was my privilege both to introduce him and to conduct an hour-long interview with him for the benefit of our theology students. Alluding to theology’s traditional, but now tarnished role as Queen of the sciences, I introduced John as “the Queen’s foremost English prince.” I also had seventeen questions prepared. Many of his answers are worth reproducing, but I’ll confine myself to just one. How, I asked, do you approach the task of theological commentary on the Bible (this in reference to his forthcoming commentary on Ephesians). What struck me was the order in which John placed the three most important contexts: he considered as least important the historical context of the individual author; next came the canonical context; but he accorded first importance to the economy of revelation, the context of God speaking to the church. WWJWD? What would John Webster do? I often find myself asking this question. It matters because it’s my conviction that if evangelical theology is to flourish, it must do theology the way John Webster was beginning to do it, both in style and substance. 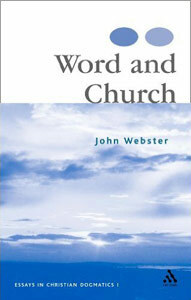 Webster’s brief autobiographical account, “Discovering Dogmatics,” relates how he found his theological voice. Like the early Webster, evangelicals have spent a good deal of time–too much!–clearing their throats (i.e., working on methodology) or coughing nervously Like Webster, evangelicals need to learn not to be overly concerned about what others will think of them, and to be more concerned with bearing cheerful and true witness to the gospel.and making comments about the weather (i.e., things everyone agrees on). Evangelicals have spent too much time in defensive or reactive postures, trying to win the battle with modernity and postmodernity by fighting them on their own critical or postcritical terms and turf. Like Webster, evangelicals need to learn not to be overly concerned about what others will think of them, and to be more concerned with bearing cheerful and true witness to the gospel. John learned to do theology in the indicative mood. Indeed, that God is not only mindful of but cares for us to the point of assuming humanity leads the theologian to make “astonished indications”: statements about what the God who has perfect life in himself did when he was “with us” in Jesus Christ and died “for us” on the cross. John has left us with a treasure-trove of “astonished indications”–theological testimonies to the being and work of the only true God. I am profoundly grateful for so many exemplary essays that exhibit the loving, patient, and intelligent descriptions of God and the gospel to which all evangelical theologians should aspire. Kevin J. Vanhoozer (PhD Cambridge University) is Research Professor of Biblical and Systematic Theology at Trinity Evangelical Divinity School. 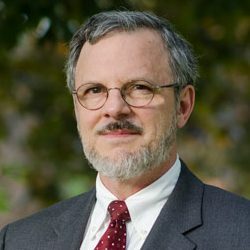 He is the author and editor of numerous books, including The Drama of Doctrine (Westminster John Knox Press, 2005), Remythologizing Theology (Cambridge University Press, 2010), and Faith Speaking Understanding (Westminster John Knox Press, 2014).